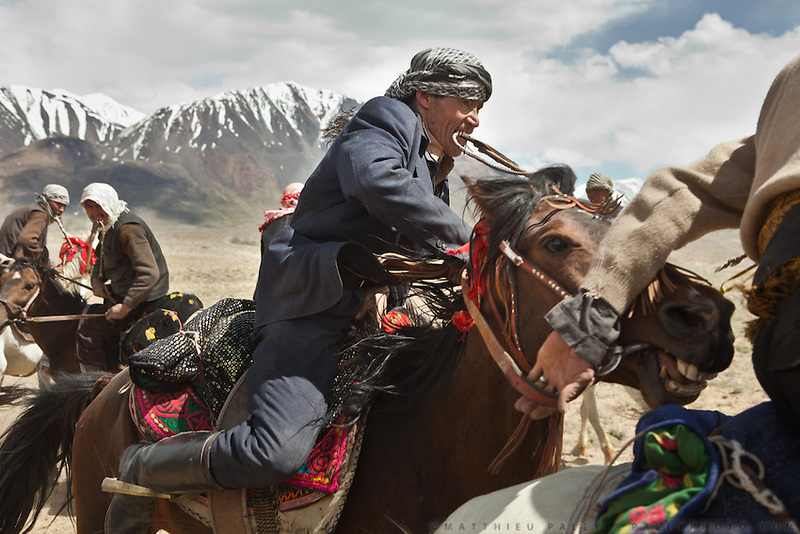 Whip in mouth, a Kyrgyz man steers his horse in a game of Buzkashi, a competition akin to polo?except a headless goat carcass takes the place of the ball. .Buzkachi is almost exclusively played during weddings..Probably one of the great pleasures in the life of a Kyrgyz man, Buzkashi is Afghanistan's national sport. The Kyrgyz call it ulak tartysh, or ?goat grabbing. ?..Wedding celebration at Kitshiq Aq Jyrga...Trekking through the high altitude plateau of the Little Pamir mountains (average 4200 meters) , where the Afghan Kyrgyz community live all year, on the borders of China, Tajikistan and Pakistan.